We have only made passing reference to Mad Men this season, so we thought we would attempt to discuss “Waterloo” the final season, mid-season finale. Is that what we call it? Warning: SPOILERS AHEAD. Kerri: Well. That sure was something, wasn’t it? We landed on the moon and Bert is dead and the partners might be millionaires. So let’s jump right in, shall we? I’m going to start by hopping right onto the giant elephant in the room: That Ending. We’ve had song and dance numbers on Mad Men before and we’ve had dreamy/druggy sequences but nothing that comes close to whatever this was. And, for the record, I loved it (and I loved the entire finale). Although, I loved it without completely understanding exactly what it meant or why Don was seeing a shoeless, dancing Bert Cooper (Ghost-Bert? Dream-Bert?) in front of him, just after he was announced dead to the agency, singing ,”The Best Things In Life Are Free”. Why does Don’s mind create this fantastical image for him at this moment? One of the things the musical ending does, for me anyway, is round out just how much money talk there is in the episode. There is the hunky teen that visits Sally and family who cynically complains about the moon landing costing 25 billion dollars while people go hungry in the US. There is Peggy telling her handsome repair man that she won’t pay him until the work is done. And Peggy explaining to Julio that his mom took a job elsewhere because she loves him. There’s Don’s insistence that he can “take care” of Megan, clearly monetarily, when they both realize their marriage has failed. There is Joan’s complaint about Don costing her money. There is, of course, the discussion about McCann buying 51% of the agency and what that means for the partners. And one of the best “Pete being Pete” lines, when he happily realizes he has a 10% share. But what this money talk really does, of course, is make it easier for us to see “the best things”, the free things, in the episode. There are so many beautiful moments where people share something human with each other. There is, most obviously, the moon landing that works its way into all of the character’s minds and hearts and, then, into Peggy’s wonderful pitch to Burger Chef. The moon landing is a moment that, as Peggy says, everyone shares together at the same time, where distractions are minimized and people connect. And this is a similar connection that we see elsewhere in the episode: Sally’s kiss with the nerdy brother as they discuss the stars; Don’s gift to Peggy of the Burger Chef pitch; and my favourite scene of the entire episode, the beautiful, sad moment where Julio tells Peggy he is moving away. But then, I come right back to the ending, where Don looks on, tearfully, as Bert gleefully sings to him with a twinkle in his eye. The moon and the stars belong to everyone, he sings. But are these people missing out on these moments? Are these moments all too fleeting? Is money/work getting in the way? I got the sense that, in this episode anyway, the characters were fairly (if not fully) aware in the moments above, that they could see at least some of the beauty and humanity before them. And then, the moments pass and we are on to something else. Bert sees a man on the moon and then he dies. Jane, what did you think of the finale and all of these fleeting moments? Jane: I loved every second of the finale. I imagine I felt what sports fans feel when watching an exciting game or match. I cheered and I laughed, cried and shouted at my TV set. I love your point about the fleeting moments of human connection. Some of my favorites were shared between Peggy and Don. I loved how he wordlessly opened her beer in the hotel room as they watched the moon landing side by side on the bed. I loved how Don’s look of confidence seemed transfer to Peggy in those amazing silent moments before she launches into her brilliant Burger Chef pitch. These moments were so real and beautiful but when they get back to the agency and the McCann deal is a go, I feel that Peggy’s success will once again be overshadowed by Don’s choices. She was out from under Don’s shadow for a few fierce moments before things will be turned upside down once again.. As excited as I was for Roger to swoop in and save the day, I can’t help but think that nobody will be truly happy in the next 7 episodes. That feeling is made clear for me at the end of Bert’s song and dance number, which landed perfectly with me after the emotional roller coaster of the vote. I was elated with the feeling that the good guys won and eagerly went along with the “anything is possible” tone of the dance number. Then when it’s over and we find our way back to Don the expression on his face seems to cast what we just saw with a feeling of doom that I can’t fully explain. What were your thoughts on the finale Katie? Katie: I can’t help but feel comforted by this episode. Loneliness and the desire to find family in strangers will always be relevant. Peggy’s pitch to Burger Chef was about finding connection outside of the television set, and finding connection at the family table of Burger Chef. Watching “Waterloo” allowed me that sense of connection — hear me out — Watching TV and movies has always been such an important part of Don’s and Peggy’s lives – and Mad Men is distinctive in that it shows its characters watching screens so often. Watching a movie in a theatre is sharing a dream space with total strangers. You experience the same story and emotions, but you’re completely separate from everyone else. Mad Men has always been “event TV viewing” for me, so knowing that so many other people are watching the show at the same time, is comforting to me. 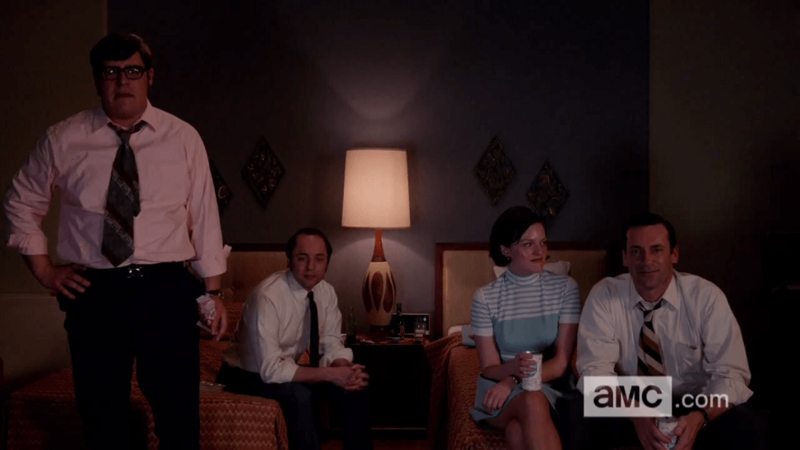 Like the characters watching the moon landing, us viewers watching the half-season finale of Mad Men are connected by our shared activity for a short period of time. It’s comforting to know that so many other people were crying and smiling in that last minute, as Bert sashays off, sock-footed. Matt Weiner knows how to stick a damn landing, that’s for sure. Pardon the pun. Kerri, what did you think about Roger’s big idea? Kerri: To borrow a line from the episode, “that was beautiful”, gals. To answer your question, Katie, I’m always less inclined to enjoy business/political maneuvering than I am to enjoy human maneuvering. I guess I’m rather cynical in that way like the hunky teen. But, in the spirit of the episode, I’m choosing to read Roger’s idea as a way to get the band back together or, the family, as it were. It’s another attempted connection and it feels more and more like Don and Roger need each other symbiotically. And it goes right back to what I think we are all getting at. I think in this episode people make very specific choices to connect with each other. And so I want to circle back to that scene with Peggy and Julio where he comes over to watch TV. Because I think the scene is deeply connected with the themes that the rest of the episode explores and especially the final dance number. All Julio wants to do is stay in this moment, to watch TV, to not move away from the apartment and from Peggy. We know that Julio resents his mother for taking a new job because it means an instant loss of connection with his friend. Peggy is more logical. She knows (or, thinks she knows, or is trying to save Julio by saying a little white lie) that Julio’s mom is doing this because she loves him and wants the best for him. Julio has a childlike sense of what is important, friendship above all, and Peggy, despite what we can read on her face, is relegated to the more adult world of logic and reasoning. And then Bert tells us that Julio is right. I have one more little moment to point out that ties into all of this. It’s the moment after the kiss between Sally and the boy nearby telescope. Sally lights up a cigarette and stands in pure Betty Draper-stance and looks up at the stars. Jane, any additional thoughts? We haven’t talked at all about Stan! Jane Sally gave that boy the kind of perfect memory that Don or Peggy would kill to tap into for a future pitch! The last thing I’d like to point out is my favorite funny line of the episode. When Don tells Peggy that she will deliver the Burger Chef pitch her first instinct is to ask, “Did Harry tell you about my dream?” That’s a dream I’d like to know more about. I’d also love to see the scene next “season” where Lou finds out about the buy out! Kerri: Thanks for taking the time to share this with me. I’ll steal another line and say, “bravo”.